Strengthen your team today with our Inflatable games for corporate team building. Plan fun team activities designed to bring your people together. 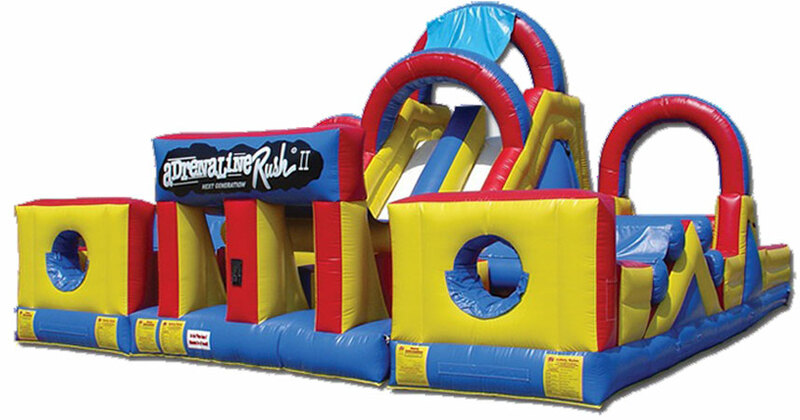 Choose from inflatable rock climbing or our giant obstacle course. Coupled with Mechanical Meltdown (coming in May) you will instantly provide a natural change from the day to day grind. Not only will your people come together, but also become part of a common outcome. Strong team members challenged with big goals equals collaboration. Use these innovative ways to build team trust and support. Happy teams means happy customers. And less stress equals better performance, after all. 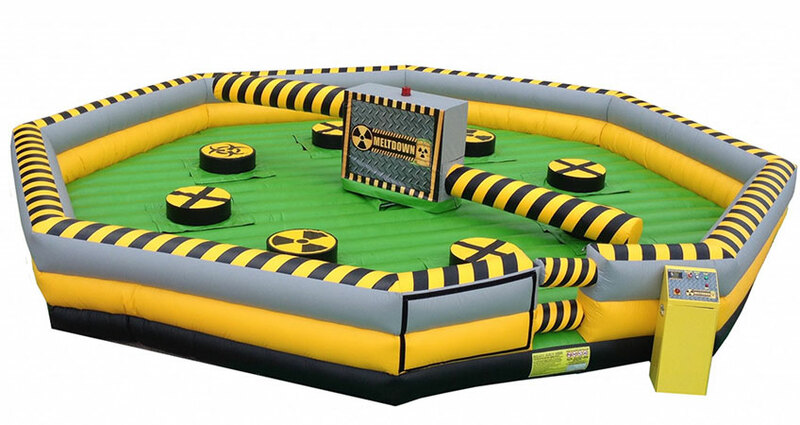 COMING SOON (JUNE 2019) - TOXIC MELTDOWN INFLATABLE WIPEOUT GAME! With a maximum of 8 players, this one will have your hearts a thumping! A challenge of agility, stamina and above all, reactions. Two spinning booms will try to knock you off your pedestal. The goal is to jump over the boom or duck under it. 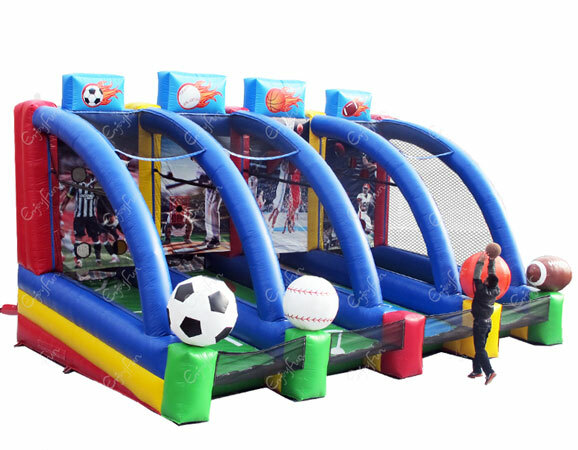 This game is a 30' x 30' inflatable and all 8 pedestals can be removed. With fully adjustable boom speeds to make 'em or break 'em, you can get ready to be wiped out! This one is the ultimate inflatable interactive game! Up to 4 players can play at any given time. Players can kick a soccer ball through the goal, throw a baseball at the strike zone, shoot free throws and throw touchdowns through the targets! This is a sports fans dream come true! The name says it all! This obstacle course kicks off with a dive through the start opening, a small climb over, then a quick crawl under inflated logs. Tumble through the obstacle, take a u-turn to climb the wall then finish with a big slide at the end. Eighty feet of total exhausting obstacle action! In this game, two people compete by strapping on a harness and then running down the inflated lane. They must stretch against the super bungee cord to see who can place their Velcro baton farthest. Love this game! This one is just like on the hit game show American Gladiators. 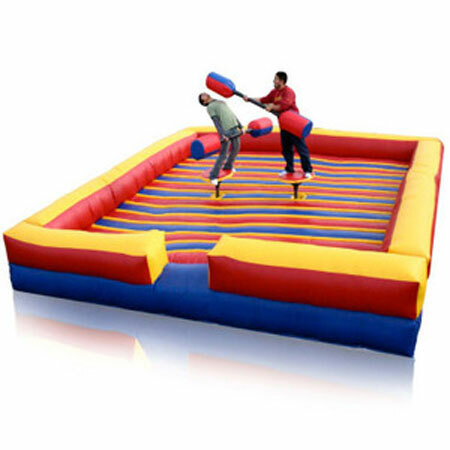 While standing on their pedestals surrounded by a large inflatable pillow, two Gladiators enter into battle by striking, swatting and pushing each other with giant inflatable batons until one of them falls off of their pedestal. Pretty funny! Climb an inflatable mountain today! 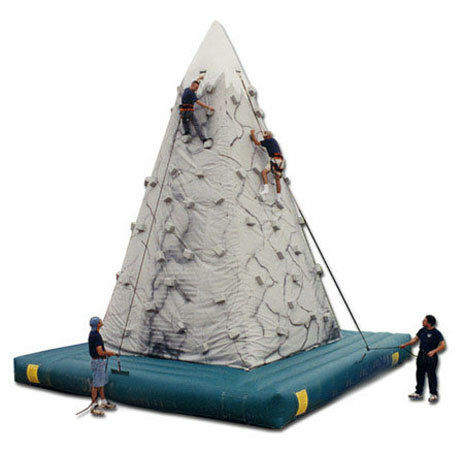 The Mountain Climb is a freestanding inflatable that is anchored down with stakes or sand/water weight on each of the mountain's four corners. This interactive unit has four sides of different difficulty tracks to reach the top; two of the four sides are used at one time. Participants must try and reach the top in this adrenaline-pumping, physically demanding game. Not for the faint hearted, nor those with acrophobia. 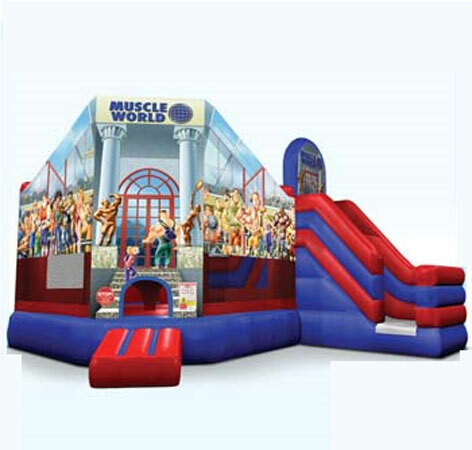 Welcome to the Muscle World Bounce House! This is the perfect inflatable for any sports, wrestling or beach event. 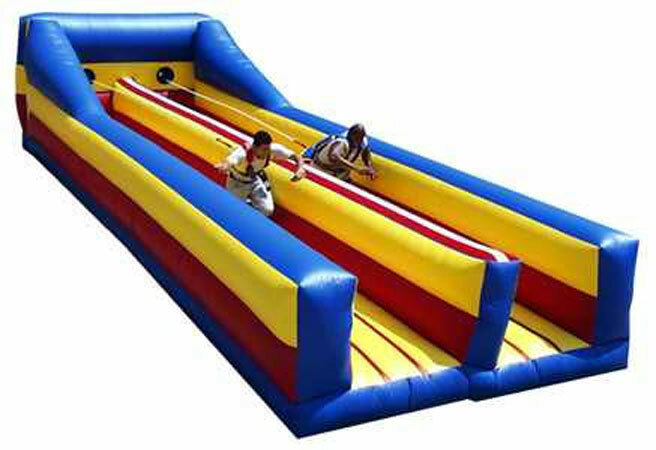 Bounce, crawl or slide in three different areas, this one is sure to get your guests pumped up. Your next event will get that adrenaline boost that only being buffed can bring!